Osmosis: Prions (Spongiform encephalopathy). (2019, April 24). Retrieved from (https://www.osmosis.org/learn/Prions_(Spongiform_encephalopathy)). 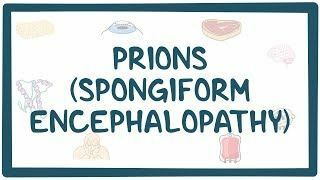 Transmissible spongiform encephalopathies, also known as prion diseases, are a group of progressive conditions that affect the brain and nervous system of many animals, including humans. Mental and physical abilities deteriorate and myriad tiny holes appear in the cortex causing it to appear like a sponge when brain tissue obtained at autopsy is examined under a microscope. The disorders cause impairment of brain function, including memory changes, personality changes and problems with movement that worsen over time. encephalopathy is characterized by dementia, ataxia and death. A 50-year-old man of Italian descent comes to the clinic because of progressively worsening insomnia. He has also experienced rapidly progressive changes in his mental status and behavior, including inattention, impaired concentration, and confusion. The patient also reports feeling in a dream-like state during his waking hours, and has had hallucinations. He is hypertensive, tachycardic and hyperthermic. On physical examination, the patient is sweating excessively. A sleep study is performed to assess his insomnia. The patient's sleep study demonstrates an inability to progress beyond Stage 1 sleep. Which of the following is the most likely diagnosis?